An analysis of the various scenarios and how they could affect charitable giving. The cost of revenue neutrality on this round of tax reform will either be tax increases on individuals or temporary tax reform. With the evaporation of the revenue stream from the border adjustment levy, either the goal of revenue neutrality will be achieved by raising taxes on the highest income taxpayers, or additional deficits will be accepted as part of a mid-December extension on the debt limit. Full expensing of capital expenditures coupled with lowering the top corporate rate of 35 percent, while laudable, is extremely expensive. According to the Tax Foundation, the cost of a top rate of 25 percent and full expensing would be between $1.2 trillion and $2.8 trillion.6 Lowering the top rate alone would cost between $449 billion and $1.085 trillion.7 Until Ways and Means votes a bill out of Committee, recommendations about year-end tax planning require an educated guess. One needs to know the cost of sought-after reforms to predict what provisions are vulnerable to repeal. The Department of Treasury’s Office of Tax Analysis annually analyzes the lost revenue from all tax expenditures under the IRC. 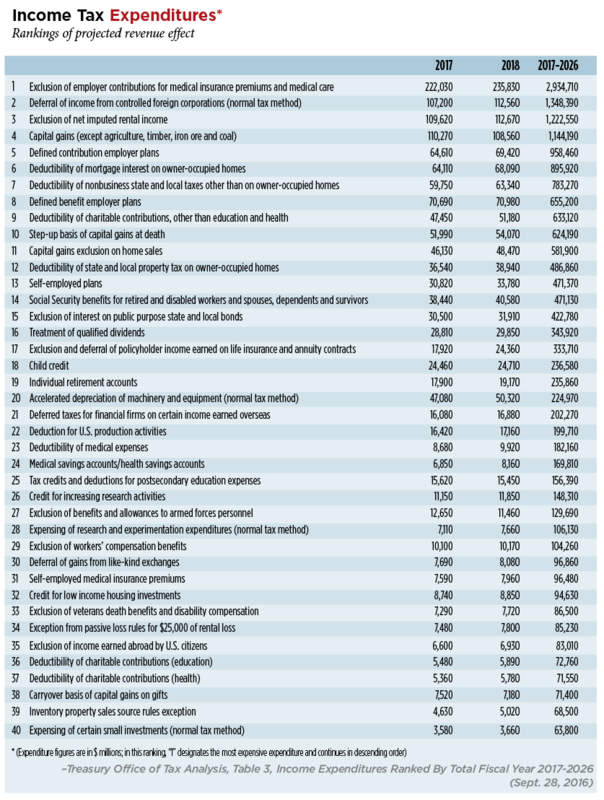 (See “Income Tax Expenditures,” p. 18.) The most expensive tax expenditures have broad public appeal, supporting charitable giving, home ownership, retirement savings and health insurance. Raising the revenue for individual and corporate rate reductions isn’t as easy as repealing the most expensive tax preference. For example, eliminating the exclusion of employer-sponsored health insurance would raise $3.1 trillion to $3.4 trillion,8 providing not only the replacement revenue from the repeal of the net investment income tax (NIIT) but also finance corporate rate cuts. Of course, that repeal is a nonstarter for this Congress as its predecessors delayed the effective tax of the Cadillac tax on high benefit plans. Eliminating the charitable contribution would raise about $665 billion to $692 billion,9 but Congress is moving in the direction of preserving or maybe even expanding the deduction. Probably the biggest bargaining chip the Trump administration and Republican Congress have is repeal of the deduction for state and local income and property taxes. Not only does it raise meaningful revenue, but also it has the political advantage for the majority party of being paid by the “high tax” blue states of New York, Connecticut, New Jersey, Massachusetts, Illinois and California. Here are the likely provisions to be part of a comprehensive or limited reform of the Tax Code and how they’ll affect giving. The removal of the AMT enhances transparency and ease of determining one’s marginal rate and thus increases the savings from charitable contributions. Depending on the finalized rates on taxable income, the cost of charitable giving could decline if the new rates are less than any of the applicable AMT rates of 26 percent, 28 percent, 32.5 percent or 35 percent. No longer will the donor’s advisor need to determine whether the AMT position is either permanent or temporary because of some outlier income inclusions or deductions. Repeal of the NIIT. To the surprise of many, the NIIT is still standing. The last serious attempt for its repeal will be the tax reform legislation. Its repeal would cost between $444 billion and $628 billion over 10 years and improve the after-tax income of the top 1 percent between 2.7 percent and 3.4 percent.14 Because this group contains the most generous givers, more giving might be possible even if their marginal tax rates on capital income decline. Introduction of the above-the-line charitable deduction subject to a floor. Dramatically increased standard deductions will eliminate the need for most taxpayers to itemize deductions. 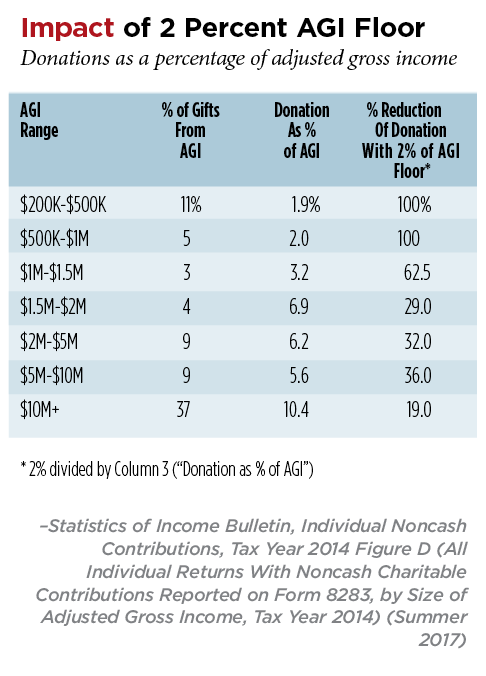 A floor based on a percentage of adjusted gross income (AGI) also has potential to reduce charitable giving. A reduction in the top marginal rate from 39.6 percent to 35 percent increased the cost of charitable giving from $60.4/$100 contribution to $65/$100 contribution, an increase of 7.6 percent. The reduction in charitable giving with a 2 percent floor is significant but borne most by those with income under $1 million because they give 2 percent of AGI. (See “Impact of 2 Percent AGI Floor,” this page.) Even incomes at the $1 million to $1.5 million range would be dramatically reduced. The least impact would be on those with income greater than $10 million. Repeal of Pease limitation. Higher income and not the amount of charitable or other itemized deductions triggers the Pease limitation.15 It reduces itemized deductions by 3 cents for income earned above an inflation-adjusted threshold based on filing status. No more than 80 percent of the itemized deductions may be reduced, thus operating as a 3 percent surtax on the marginal rate. For example, it raises the top marginal rate to 39.6 percent x 1.03 percent or 40.788 percent. Its repeal will thus lower marginal rates but increase the after-tax cost of giving. But remember, the Pease limitation likely impacts few charitable givers as nondiscretionary deductions for taxes and mortgage interest expense absorb most of it. An additional uncertainty about a tax reform bill is its effective date. Will it be retroactive to Jan. 1, 2017? Retroactivity is politically attractive for the legislators, as taxpayers will be seeing their refunds when filing in April 2018 before the primary and general election cycles. If retroactive, any reductions on marginal tax rates make charitable and other itemized deductions more expensive than contemplated by the donors when they made their gift. What if the effective date is in 2018? There will be a likely frenzy of year-end giving to take advantage of the current law and avoid the impact of likely restrictions on giving imposed by a floor based on AGI and lower marginal tax rates. There’s one hedging technique, albeit an imperfect one, to address having made a 2017 contribution when the marginal rates are retroactively reduced. A Roth individual retirement account conversion done in 2017 can be undone if needed should the rates be lower in 2018. If the rates are lower in 2017 because of a retroactive effective date, that charitable contribution reduces the taxes on income from the conversion. Of course, the lower rates reduce the savings from any charitable contributions. If, however, the taxpayer had tried to zero out the gains from the Roth IRA conversion with a charitable contribution of an identical amount, then the taxpayer still has avoided creating a net gain from the Roth IRA conversion. A Default Reform on the Horizon? The entrenched beneficiaries under the IRC often protected by bipartisan support create the political momentum toward greater, not less, complexity. Losers under any reform are often quickly identified; winners may either not be readily identified or be skeptical of their improved fortunes. It took Congress only four years to raise marginal rates after the Tax Reform Act of 1986. Skepticism about the durability of any reform is appropriate. Any enacted legislation branded as “reform” will be more about tax cuts, though some groups may well be paying more. The revenue needed to provide dramatic corporate income tax rate reductions ultimately will need to come from a new source in a future Congress. What was so intriguing about the border adjustment tax was its originality and impressive revenue potential. Unfortunately, the difficulty in clearly explaining its operation and the lack of a track record in predicting price rises doomed it from serious legislative consideration. 1. The House Ways and Means Committee conducted 26 days of markup on tax reform beginning on Sept. 18, 1985. The Committee voted out a bill on Dec. 7, 1985. The full House approved by voice vote the bill on Dec. 17. See Joint Committee on Taxation, General Explanation of Tax Reform Act of 1986, at pp. 1-2. The Tax Reform Act of 1986 was signed into law on Oct. 22, 1986. 2. See Howard Gleckman, Tax Policy Center, Would Workers Benefit from A Corporate Tax Cut? Not Much (Sept. 8, 2017). For the contrary view that labor bears the burden, see Adam Michel, Heritage Foundation, “The High Price That American Workers Pay for Corporate Taxes” (Sept. 11, 2017), www.heritage.org/taxes/report/the-high-price-american-workers-pay-corporate-taxes. 3. Joint Committee on Taxation, “Explanation of the Tax Reform Act of 1986” (May 4, 1987), at p. 1357. For the period 1987 to 1991, revenue from corporations was anticipated to rise by $120.3 billion; revenues from individuals were anticipated to decline by $121.9 billion. 4. Ibid., at pp. 8-9. 6. Tax Foundation, “Options for Reforming America’s Tax Code” (2016), at p. 82. 7. Ibid., at p. 69. 10. Ibid., at p. 53. 11. Ibid., at p. 51. 12. See Christopher P. Woehrle, “The AMT: Still A Trap for the Unwary,” Trusts & Estates (October 2016), at p. 49. 13. Tax Foundation, supra note 6, at p. 60. 14. Ibid., at p. 32. 15. See Internal Revenue Code Section 68. 16. Tax Foundation, supra note 6, at p. 91 on revenue raising potential of 5 percent value-added tax without large exemptions for sectors of the economy such as healthcare and nonprofits. 17. Bruce Bartlett, The Benefit and The Burden: Tax Reform—Why We Need It And What It Will Take, Simon & Schuster, (2012), at p. 202.